Because attendance is not required for Stake Conference, I dont think it is, is it? We (Renee, Niah, Cory Reese and Jackson Reese and I) decided to attend our own Sunday services. The Church of Beautiful Southern Utah! Worship services would be held at Cedar Breaks National Monument (CBNM). I have driven past Cedar Breaks numerous times, even stopped at some of the viewpoints, but have never really explored the monument. Luckily I decided to today. Cedar Breaks is a gem of the National Monument system. There is a strong movement to make it a National Park, but that would be unfortunate. 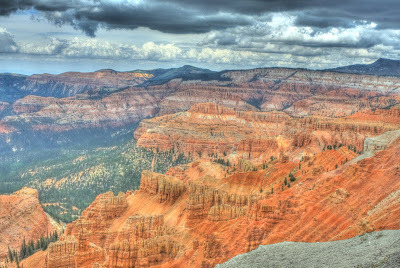 Not because Cedar Breaks is not impressive, unique and worth the recognition but because with the added recognition it will quickly be run over by tourists and will lose some of its charm. Cedar Breaks is a unique place. The combination of colors, unique formations and ancient trees make it unlike any other park, monument or any other place, and at over 10,000 ft above sea level the difference in temperature is dramatic. We arrived in shorts and tshirts, and quickly added several layers of clothing to our summer attire. After briefly stopping by the visitor center, which in itself is amazing sitting on the precipice of the colorful valley below, we decided to quickly hike to Spectra Point. The hike was only 2 miles roundtrip but was very impressive. This hike had everything from dramatic vistas to 1673 year old trees and all within 1 mile of the visitor center. For me the best part of the hike was one of the oldest living things in the world, a bristle cone pine that has been dated to over 1,673 years old. I have seen other bristle cones and they are all cool but this one was amazing. Bristle cones are usually gnarled and look half dead, and this one was not any different, what was different about this ancient tree was its size! It was HUGE. I have realized lately that for some reason I like trees, and its not because I am a tree hugger. I just like trees. Anything that can survive in such a harsh terrain for nearly 2,000 years, for me, is hard to be surpassed. Even though we were only in Cedar Breaks for a short period of time it was quite a trip. In Cedar Breaks, as the quote goes, you get a lot of bang for your buck! Hmmmm. No pictures? I need pictures, or it didn't really happen.